Smile always! It makes people wonder what you are thinking. 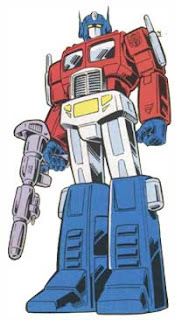 Here's the ORIGINAL Octimus Prime... from the 80s. IMHO, it's actually not THAT bad... it's got that modern-arty look. 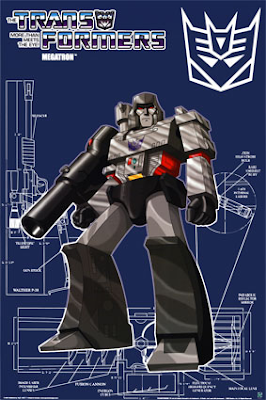 Wait... here's our fave super villian: Megatron. 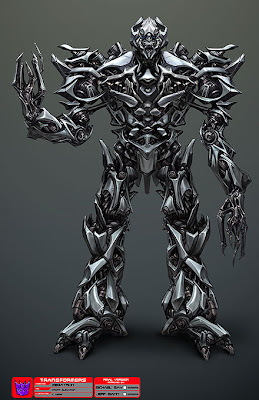 Yeah.. Megatron looks really really crap bad... Looks like those metalic sculpture made of recyclable junk and scraps of aluminium (sample below). Hey.. at least it's environmental friendly! The reporter check out three stores in the city, two EB Games stores and a JB HiFi, and the word that came to his mind is 'underwhelmed'. With just a half hour until the launch of the console the stores were virtually empty. In all three cases there were more store employees in the shop than there were customers. EB Myer Center had 2-3 customers. EB Queens plaza had 4 employees, a security guard and zero customers. JB HiFi was a similar story. Rigs were set up with the new console displayed on pretty TV's, but according to the reporter, the only people taking advantage of them were employees. This is in high contrast to the Nintendo Wii launch just a few months back, where stores required police for crowd control even out in suburbs, and lines reached well over a hundred people hours before launch. Meanwhile, in the official Sydney launch event, a tiny crowd of 40 turned up at the Myer Pitt Street store (despite the free food and drinks on offer), which was the location of the "official" launch held by Myer, with Sony reps in attendance. Other stores in Sydney received even smaller crowds of 20 or so customers at best. 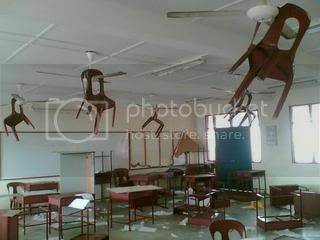 Ahh.. school, the good old days! Here's what some students did after finishing their final exams. Hahahaha..! Green everywhere! 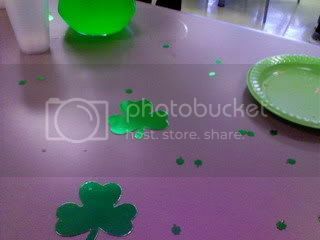 Of Course... it's St Patrick's Day~!!~!!! My workplace had a theme day yesterday and when I stepped in... almost everything's green! 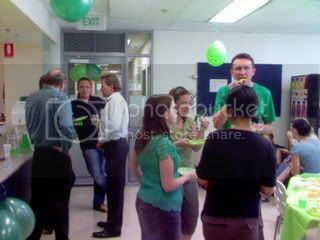 Ppl wearing green, green food, green fruits, and green drinks. Looks pretty scary I must say...like something out of a dream. Nonetheless it's pretty interesting. hahahah.. I love these Japanese game shows! Hahahaha... this is HILARIOUS! This is a clip from a Japanese game show. This troop of one hundred randomly chase people on the streets based on different scenarios. It’s interesting and funny to see how people react when they’re being chased all of a sudden. I'm EXCITED! Found this 7 mins sneak preview of Spider-Man 3... in HD! Green Goblin, Sandman and... Venom! What else can we ask for?! 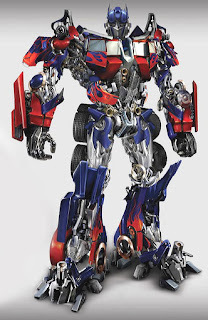 I really really love the Transformers. In fact, probably my favourite all time cartoon. Actually, if the movie version is going to look like those pictures, then hmmmmm I dunno lah whether I absolutely want to go watch it. We shall see. Anyway, unlike some people, I actually like Megatron/Galvatron. In fact, I'd say Galvatron's my favourite. People go for Optimus Prime just coz he's leader of the forces of good, but I guess I'm not a sheep ;) Maybe I'm just evil LOL.